CRYPTASSIST CRYPTOGO – HAVE FUN – WIN CRYPTO! Who hasn’t heard of or played the augmented reality game Pokemon GO* that stormed the world in recent years? And what did you win besides some virtual creatures? – Nothing! All that changes with the Cryptassist augmented reality app – CryptoGo! CryptoGo can be downloaded and played for free. Players have the opportunity, when they are at nominated locations, to locate coins that are airdropped and use Cryptassist coins (CTA) in order to capture these coins. Players will receive one free ammunition each day and will have the option to use in-app purchases to enhance their possibilities of locating and capturing coins. From time to time, Cryptassist will hold Premium Airdrops, where top listed coins such as Bitcoin, Ethereum, Litecoin and more will be available to be found. CryptoGo is easy to use, fun and most importantly, potentially rewarding. CryptoGo, part of the Cryptassist ecosystem, is the perfect segue for new crypto users to be introduced to the crypto world. To learn more about CryptoGo or the Cryptassist platform, please visit our website or download our Whitepaper at www.cryptassist.io. It is not enough to have an idea on the white paper, with the right partners and the right working mechanism, this project is heading for the moon. in the first release of PokemonGo, players were able to cheat by spoofing their location. I hope this will not happen in CryptoGo as it would be unfair to those who really travel outside to play. Very true! By cryptassist it is become easier to introduce ourself in cryptoworld! Lets have fun together. The idea of a Pokemon GO style app using cryptocurrencies is incredible, it goes far beyond the fun. Will definitely download and play the CryptoGo when it launches. Who wouldn't right? Go cryptassist! This is a great feature! Although CryptGo will not be the first to use AR and crypto to Airdrop Coins which than can be catched by players. I recommend the Aircoins App for now. It's quite fun! Available for Android. IOS coming soon. njoy . ..
I’m sure that this project will help a lot of people all over the World. And this is great! The most technically innovative idea generated by @cryptassist is the gaming app.. By yhis concept anyone can easily gain crypto by playing, enjoying and paying.. Hence paying by playing is the most creative platform.. Love this game.. It is great that, you will entertain the users of the community by providing an opportunity to earn some tokens! Nice to introduce this type of feature by a new project. This will be great success in future!! This is the coolest feature in the Cryptassist platform. I'm really waiting to play this game and earn some cryptos while having fun. Finally, every day crypto payments are arriving with cryptassist! Thank you very much! The cryptoGo feature of the cryptassist platform is an innovative one indeed. This platform will serve as a place where project managers can make announcements of their project in the form of airdrop. This platfrom would be so big that news about airdrop of a project will reach far. Cryptassist and blockchain is the future. this is really a great idea, it will make people to play more games knowing full well that they will get paid doing that. It is momentous that, you will engage clients of network, giving a chance to win a few images! Awesome application and good to the community. CryptoGo game is a great way to spend your free time and earn some money. cryptogo is a very good feature provided by the cryptassist. Great to be a part of it. Crypto assist are they building their own blockchain? Play game and get rewarded with the CryptoGo feature. This is an outstanding platform this game will improve on cryptassit platform. #CryptoAssist holding Premium Airdrops will be great, this will save Airdrop hunters wasted time signing up for scam airdrops and bounties. The smart thought and solid group, nearly take after this venture, and I trust that this begin will accomplish them the goals. It is the promising organization with the fine thought. If launched, this will help crypto traders have fun while trading cryptos. Cryptassist speaks to the abnormal and troublesome thought. Expectation that with help of financial specialists they will make progress. cryptogo - great component gave to cryptassist. Huge to be a section him. This seems to me like a very fun application! The excitement is always present since every moment new coins can be introduced and are waiting to be found. I know that many people do not have enough money to live and have nothing to refuse. Therefore invest in ICO and multiply your capital three times. Life will be much happier and more exciting! Woah, this a cool way to earn some Crypto while you are travelling to and from work. Even if you are just taking a stroll. Nice. Nice, now instead of pokemon you can catch tokens :) The Cryptassist surprises every day. I think this game will be able to conquer the gaming market. Yeah, Let's have fun together. Play and get crypto asset as much as we can. Pretty cool. I've never played pokemon go, but the new game interested me and I want to try it. Cryptography enjoys great interest and for it the future. the augmented reality is one of the biggest technology for our future , this app is great . Excellent platform with lots of handy tools !.. Many functions make the project very interesting for customers. Within the Cryptassist ecosystem will be an innovative cryptocurrency crowdfunding feature, Cryptstarter. good article.thanks to sharing.project comes with useful concept. An innovative project of a strong team in a promising direction. Join success is quite possible. This cryptassist project is going to solve a major problem in the industry. So I think it will be more attractive to the users. We are excited to present you unique platform will be based on blockchain system and will unite many life spheres. Cryptassist presents an unusual and difficult idea. It is hoped that with the support of investors they will succeed. 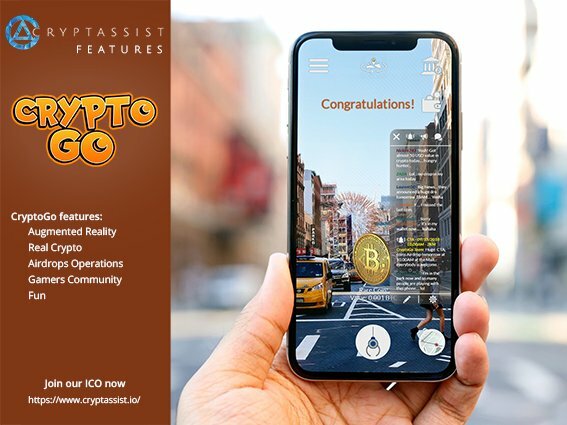 Now that the augmented reality games are so fashionable, I think it's a great success to incorporate Cryptassist CryptoGo to the Cryptasisst platform. I think is the perfect segue for new crypto users to be introduced to the crypto world. In this way, gaming enthusiasts and newcomers will begin to take an interest in cryptocurrencies and, more importantly, they will do so through the Crypasssist platform. Awesome, hope will use soon, the project is gaining popularity, it began to include interesting people among whom it is nice to meet like-minded people. Now there is a superb opportunity to use the free Cryptassist application to download CryptoGo! What else awaits us in the future from Cryptassist ?! This is great. It will be just a top game with a big audience.